Eduard Nápravnik, while born east of Prague, spent most of his adult life in Saint Petersburg. He began his musical career as a rehearsal pianist at the Russian Opera in 1863. Within six years, he had become principal conductor, a post he held until stepping down in 1914. He helped make the Mariinsky the hub of musical activity in the Russian capital, and his time there is remembered as the “Nápravnik era”. He succeeded Anton Rubinstein and Mili Balakirev as director of symphonic concerts for the Imperial Russian Music Society. His development of the opera orchestra was such that Mahler said it reminded him of the Vienna Philharmonic. He was a friend of Rachmaninov and Tchaikovsky – clearly then an important figure in the development of Russian music. He was also a prolific composer, mostly in the summer months. His piano concerto appeared in Volume 37 of Hyperion’s Romantic Piano Concerto series (review) and was described by John France as enjoyable but also as a written-to-order potboiler. 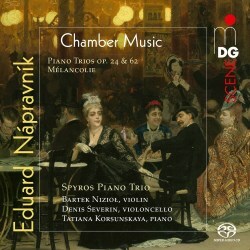 A few orchestral pieces, including a version of Mélancolie also presented here, were part of an Evgeny Svetlanov release (review). Our reviewer commented that Mélancolie was a work that deserved to be better known. On the evidence of these two trios, I would side with the music critics of the day who were quite scathing about his compositions, though I would agree that Mélancolie is a fine work. At in excess of thirty-five minutes, the first trio is far too extended for its very slight musical foundations, a common fault of the unsung composer. There are some good moments, but too quickly they fade into blandness or banality (or both). The later trio is better, partly for its relative brevity, but also for holding the interest for somewhat longer. I don’t hear any particularly Russian quality to them; they strike me as more influenced by Brahms. The slow movements, including Mélancolie, are unquestionably the best. The Spyros Piano Trio was a new name to me, but a little research found that they had recorded for MDG as a trio under their individual names. I did recognise that of the violinist, Bartek (also known as Bartłomiej) Nizioł, who has recorded as a soloist for Hyperion and other labels. I don’t think my disappointment with the music was a consequence of their performance. The booklet notes are very comprehensive, though they imply more musical interest than there is. The sound quality is good – I couldn’t listen to the SACD format – but I could have done without the rather prominent sniffing. Sometimes one finds an unsung composer whose obscurity is undeserved; sadly, that isn’t so here.